ISSLive : Interact with live streaming data from the International Space Station (ISS), Take virtual 3D tours of the Mission Control Center (MCC) and ISS, and View console displays, crew and science timelines for a fun, educational experience with NASA. Working with the NASA Education Office, ISSLive! content serves as the basis for development of interactive lessons in the Science, Technology, Engineering and Math (STEM) fields. ISSLive! is also a resource for the space enthusiast, the educator, and the life-long learner to participate in the mission of the ISS. Bizarre, Frustrating UI This is an amateur, beginner application. It’s claimed to be an Android application, but it has a bizarre user interface – apparently based on EMACS. What’s with landscape only? Why doesn’t the Back button work? Tap “X” on screen instead of Back? What’s with the different styles of on-screen menu but no menu button? What’s with the lengthy “loading” screen between each activity? I’m an Android application developer, and I actually gave up trying to get the license agreement screen to work. It’s only after I saw another comment here that I figured out it’s possible (you have to scroll to the bottom, tap on the tiny “x” and get it to change, then tap on the even smaller “Accept” button. Obvious). Nice effort Interesting app although the UI in some parts is unconventional (took me about a minute to work out how to accept the license agreement, moving around the MCC goes in the opposite direction than I expect). You get to see the various control centre screens although I would love to see all of them. 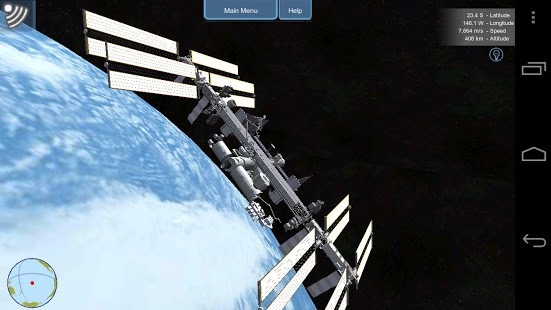 There is also a rendered view of the ISS in orbit which would be nice as a live wallpaper.